We are accepting contributive talks and contributive posters. All submissions must consist of a title and an abstract consisting of less than 300 words. This must also be submitted in .tex format at the moment of the application. Mind that contributive talks should last less than 25 minutes and posters be presented in A0 pages. See Registration for more details on the registration fees and also for the on-line payment link. Mini-symposiums should include 4 speakers. Larger mini-symposiums can be requested, but mind the length of it so that appropiate time-allocation can be arranged. Other variations, such as satellite meetings or discussion panels are also welcomed. At this stage, we are not requesting titles or abstracts of the mini-symposium speakers. We strongly recommend flying into Uruguay via Montevideo International Carrasco Airport. 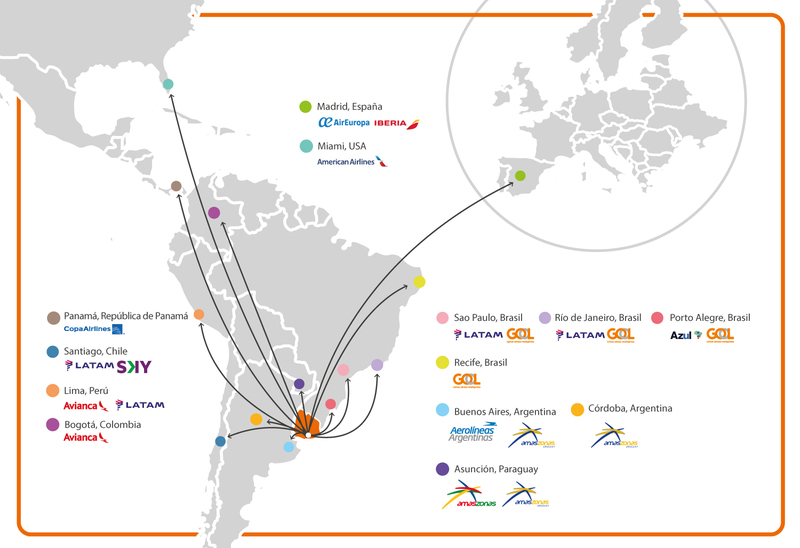 Below you can find all airports with direct flights into Montevideo (click to enlarge). If flying from outside South America, we recommend planning for a layover in São Paulo, Miami, Panama or Madrid, as these are airports with a larger number of flights inbound from around the world. If flying into São Paulo (Brazil) or Buenos Aires (Argentina), please note there are two airports in each city: Guarulhos and Congonhas in São Paulo, and Aeroparque and Ezeiza in Buenos Aires. Plan your trip accordingly, taking into account inbound and outbound airports, and layover times. Transit between airports can be time consuming and/or expensive, and will imply checking out your luggage, and checking in again at the new airport. The inter-city bus service in Uruguay is of good quality. Two bus companies, named COT and COPSA, operate between Montevideo and Punta del Este, both having bus shuttles going from Montevideo’s main bus terminal (Tres Cruces) and from the airport. These buses depart from Terminal Tres Cruces at Montevideo, having a stop at the Carrasco Airport to pick up arriving passengers. Both companies have commercial offices at Tres Cruces Terminal, but only COT has a commercial office at the Carrasco Airport. The distance from Montevideo to Punta del Este is approximately 140km, which takes the bus about 2 hours from Montevideo.